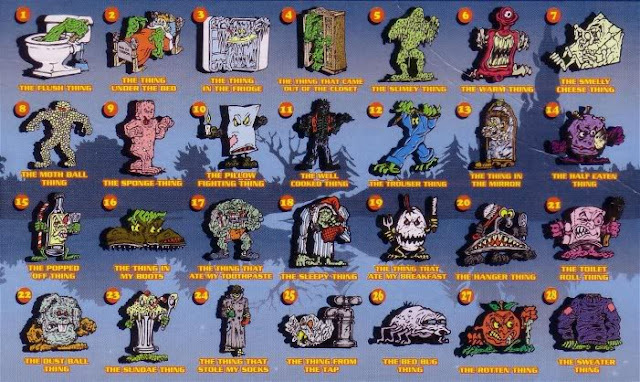 Thingz That Go Bump in the Night is a short-lived mini figure line released around 1997-1998 by a company called FEVA, I believe exclusively in the U.K. 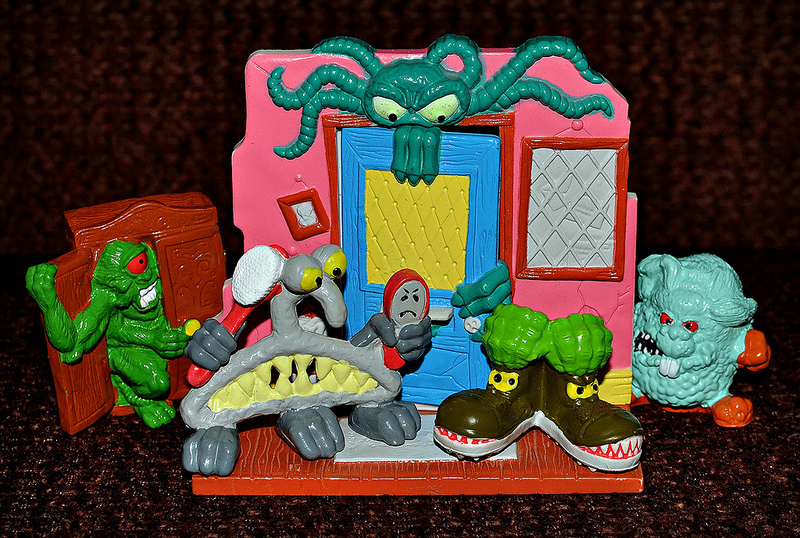 The concept is common household items come alive as monstrous little weirdos. 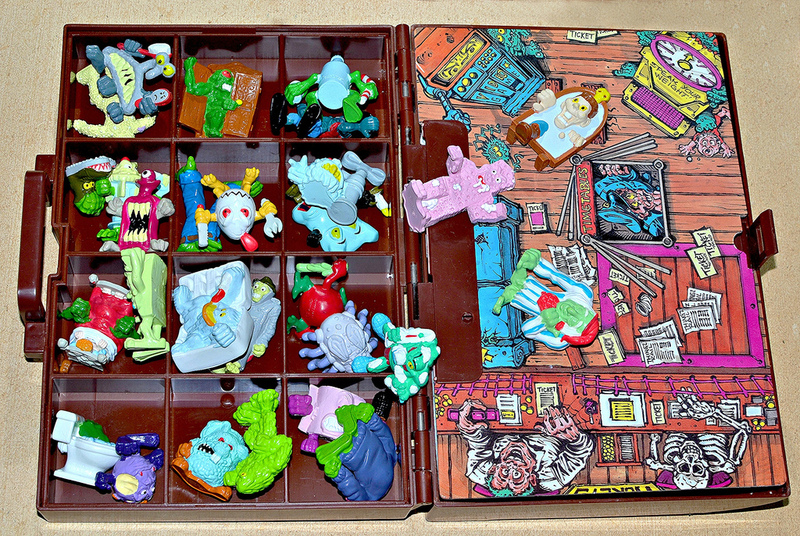 The figures were sold a couple different ways, including in 4-packs and 2-packs. They are made of firm but slightly flexible plastic, fully painted, and average about 1.5 to 2 inches tall. Below you can see all 28 figures along with the illustrated checklist that includes each of their names (I pulled the checklist image from somewhere, but I can't remember where--if it's yours, let me know and I'll add credit). 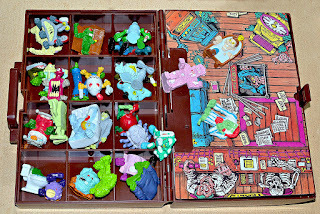 I happened to pick up nearly a full set of these, as well as the carrying case, in one shot. So of course I had to go ahead and complete the set. These are really fun figures, with certain sculpts definitely standing out. Some of my favorites are The Sponge Thing, The Moth Ball Thing (gotta love a mummy-like dude made out of mothballs), The Toilet Roll Thing, The Thing That Came Out of the Closet, The Thing in the Fridge, and The Thing That Ate My Breakfast. 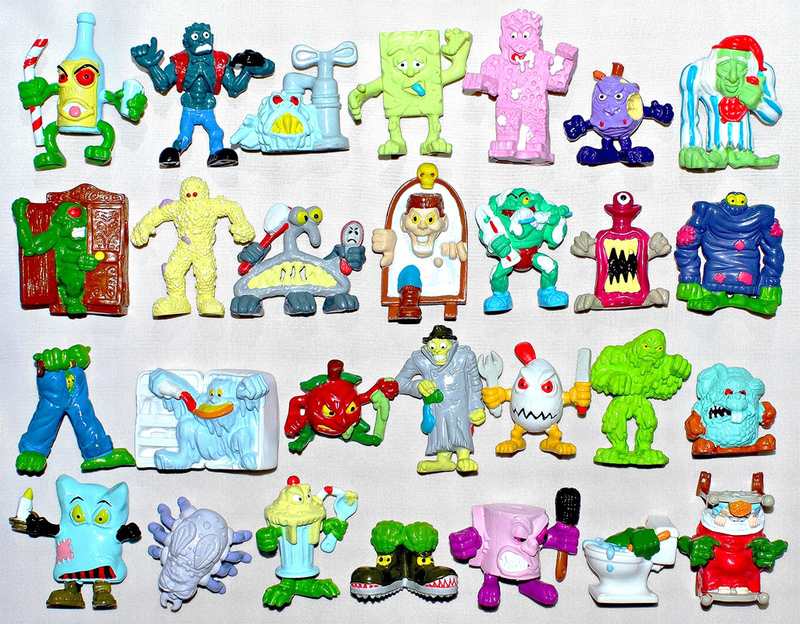 Here's a couple of the backdrops with some of the Thingz hangin' out in them. Overall, Thingz is a cool, obscure toy line worth another look (or for most, probably a first look). I'd probably like the figures even more in monochromatic colors, but what can you do. 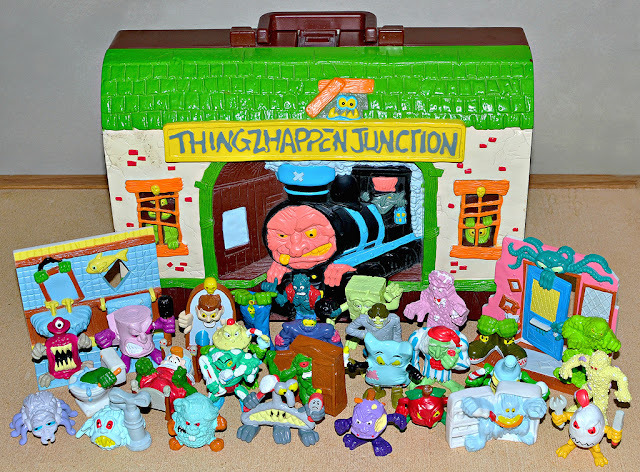 You can see another article on Thingz here, which includes photos of a few of the cards, the Haunted House playset, and a packaged shot. What about you -- have you ever come across these guys? What do you think? Never seen these before, but I like 'em. They'd make great adversaries for the Ghostbusters RPG! Oh yeah, these came about just as I was on the edge of the "target market" (or maybe after - I was 12 or 13 and still obsessing over toys, nothing changes!). Loved everything about them, some genuine creeps amongst them (the sock stealing thing and the mirror thing definitely). There was a nice little stop-motion advert for them on TV at the time as well. Took me about ten years to finish the set (initial original purchases plus occasional swaps on the LRG forum), glad I got them all in the end though. I'm not sure if the Haunted House ever made it to the shops though, although I'd happily be corrected on that. You might be right about the Haunted House. When I was researching these I think the only photo I came across was a promotional shot. Yeah I keep going back and forth on if I want to start collecting these. But damn there are quite a few sculpts i want. The overcooked thing is practically a zombie. It's a shame too about the haunted house play set. 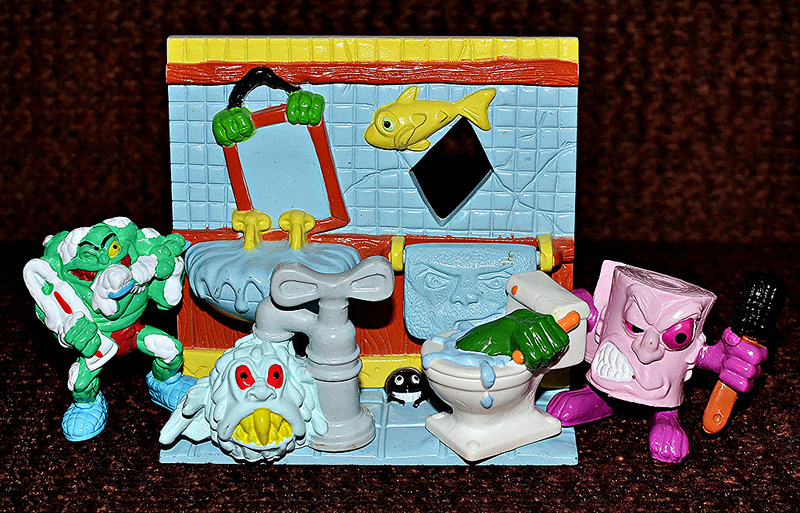 I love haunted house play sets and they are too few and far between. Yeah, it's too bad. It would be a cool display piece for monster minis. Gave you a link on my site (The Forgotten Starship) to this page. Really informative, and was a big help with my post, especially naming what each creature was called! Glad you found it helpful, and thanks for the link!